October is upon us. The leaves are turning colors, the weather is cooling down (finally), and the amount of essays that are due is terrifyingly appropriate for the month of horror. Nevertheless, there are many events to supplement your busy semester (and maybe even help you relax!). Akira Kurosawa is best known for his spectacular samurai films including Throne of Blood and Seven Samurai, but he also made movies set in his own time and place, like High and Low. Based on the novel King’s Ransom by Ed McBain, High and Low tells the story of a rich man and a poor man and the barriers between them. It’s also a thrilling kidnapping story! Toshiro Mifune fans will get a kick out of seeing him as the head of a women’s shoe factory while anybody interested in LSJ will find plenty to talk about by the end of the film. All are welcome. 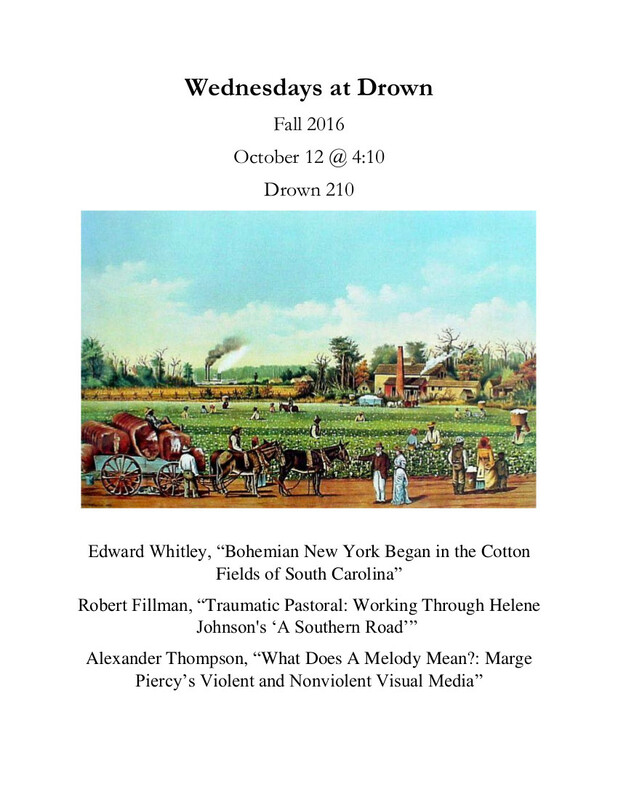 On Monday October 10 at 2 pm, Drown Unbound will be hosting our Fall Brainstorming Session in the Drown Common Room. Snacks and drinks will be provided as we discuss what the blog is doing and where it can go! The Developmental Writer Series is having an event on Friday, October 14 at 4 pm down at the Packer Graduate Student House. Lehigh alum: Jamey Gallagher will be giving a talk where drinks and snacks will be provided. Learn more about the Accelerated Learning Approach to developmental writing. Also note, that Midterm Grades are due on Friday, October 14 as well. On Saturday, October 15, abstracts are due for our Literature and Social Justice conference. This conference offers an amazingly supportive environment especially for first time conference presenters. So check out the CFP here and stay tuned to Drown Unbound for some advice on writing abstracts and more articles previewing this conference. It’s Halloween time and that means a horror film. But fear not, frightful friends, The Innocents isn’t all that scary. It is, however, spectacular. Shot in gorgeous black and white CinemaScope, this ultra-widescreen version of The Turn of the Screw is written by Truman Capote and stars the fantastic Deborah Kerr as a governess who gets in over her head thanks to some creepy kids and (maybe) ghosts. This is perhaps the best pre-70s horror film, so don’t miss your chance to see it with friends. All are welcome. On Saturday and Sunday, October 29 and 30, the delightful Dissertation Boot Camp will occur. Spend two full days in the beautiful Iacocca Hall’s Wood Dining Hall where two meals each day are provided as well as tons of supplies to help you focus and accomplish all your work. The full cost for the weekend is $30. Sign up using this link and then head down to the Graduate Student House to pay your funds. Any other events we should know about our be highlighting here? Let us know in the comments down below or send an email to lmf415@lehigh.edu.